CHALLENGE – half the Tortour The shorter race format CHALLENGE with 500 kilometres and 6,800 metres in altitude was won by Team Cannondale (category Team of 2 Men), who arrived at the IWC Arena as the very first team of the event, clocking in a time of 16 hours and 31 minutes. The Solo Men category was won by Switzerland’s Philipp Amhof with a time of 19 hours and 6 minutes. With 70km and 1 800m of vertical gain standing between Scott-SRAM MTB-Racing and overall victory on the Champs-Élysées of mountain biking at Val de Vie Estate, you could’ve forgiven them for playing it safe and cruising to the finish. Nino Schurter and Lars Forster went into the final stage from Stellenbosch University to Val de Vie Estate with a comfortable eight-minute lead over second-placed Cannondale Factory Racing. Special moment after eight tough stages trough the Western Cape for these two participants crossing the finishing line: Father and son, Gustav & Retief Joyce are the last finishers of this year’s Absa Cape Epic. 7C CBZ WILIER soloed to victory on the penultimate stage of the 2019 Absa Cape Epic on Saturday. Louis Meijato and Johnny Cattaneo seized the initiative after Trek Selle San Marco suffered a disastrous mechanical, to win the brutal 89-kilometre challenge around Stellenbosch, in a time of 03:49:21. Creative way to fix your bike: Simon Schneller (GER) from BULLS youngsters Team had to deal with a broken back axle during the race. His solution was to take what nature gives you and stabilise with some wooden sticks he found on the ground. Later he wrapped some tape around the crucial spot in order to finish stage 6 of the Absa Cape Epic. 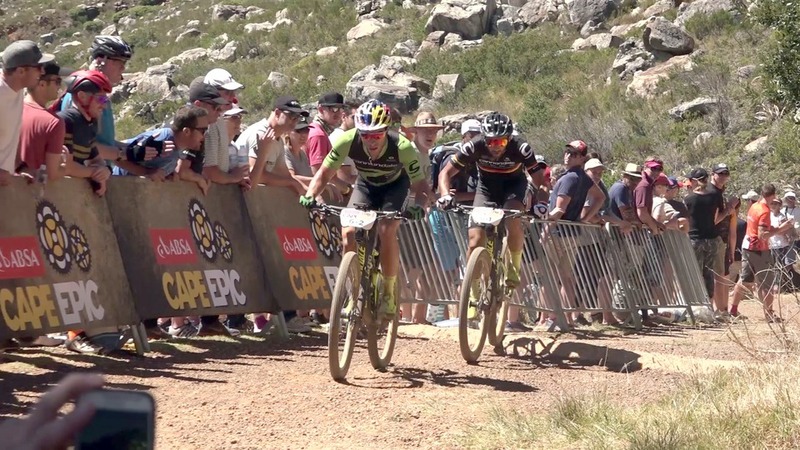 Renaissance men Matthys Beukes and Philip Buys shrugged off a disastrous first five days to win The Queen Stage of the Absa Cape Epic from Oak Valley Estate to Stellenbosch University. The PYGA Euro Steel pair is the first South African team to stand on the top step of an Absa Cape Epic stage podium since they performed the same feat way back in 2015.